Satellite photo in summer 2003 after five years of drought, reaching near-record lows. Settlements Salt Lake and Ogden metropolitan areas. Great Salt Lake, located in the northern part of the U.S. state of Utah, is the largest salt lake in the Western Hemisphere, the fourth-largest terminal lake in the world, and the 33rd largest lake on Earth. In an average year the lake covers an area of around 1,700 square miles (4,400 km²), but the lake's size fluctuates substantially due to its shallowness. For instance, in 1963 it reached its lowest recorded level at 950 square miles (2,460 km²), but in 1987 the surface area was at the historic high of 3,300 square miles. The lake is the largest remnant of Lake Bonneville, a pluvial lake that covered much of western Utah in prehistoric times. 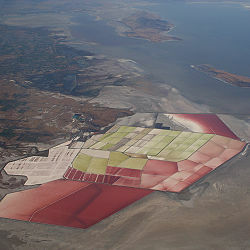 Great Salt Lake is endorheic (has no outlet besides evaporation) and has very high salinity, far saltier than sea water. The Jordan, Weber, and Bear rivers (the three major tributaries) deposit around 1.1 million tons of minerals in the lake each year, and the balance of evaporated water is mineral-free, concentrating the lake further. 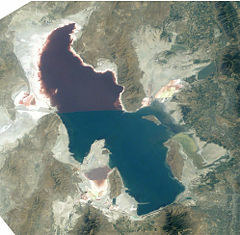 Because of its unusually high salt concentration, most people can easily float in the lake as a result of the higher density of the water, particularly in the saltier north arm of the lake, Gunnison Bay. The lake's shallow, warm waters cause frequent, sometimes heavy lake-effect snows during late fall, early winter, and spring. Although it has been called "America's Dead Sea", the lake provides habitat for millions of brine shrimp, shore birds, and waterfowl, including the largest staging population of Wilson's Phalarope in the world. Great Salt Lake is a remnant of a much larger prehistoric lake called Lake Bonneville which, at its peak surface area, was nearly as large as Lake Michigan and significantly deeper, covering roughly ten times the area of Great Salt Lake and over 1,000 feet (305 m) deep. It covered much of present-day Utah and small portions of Idaho and Nevada during the Pleistocene Epoch, more commonly known as the Great Ice Age, between 32,000 and 14,000 years ago. With the change in climate, the lake began drying up, leaving Great Salt Lake, Utah Lake, Sevier Lake, Rush Lake, and Little Salt Lake as remnants. Great Salt Lake lends its name to Salt Lake City, originally named "Great Salt Lake City" by then-President of the Church of Jesus Christ of Latter-day Saints (also known as the Mormon or LDS Church) Brigham Young, who led a group of Mormon pioneers to the Salt Lake Valley southeast of the lake on July 24, 1847. Salt Lake City and its suburbs are located to the southeast and east of the lake, between the lake and the Wasatch Mountains, but the land around the north and west shores is almost uninhabited. The Bonneville Salt Flats lie to the west, and the Oquirrh and Stansbury Mountains rise to the south. The Great Salt Lake is fed by three major rivers and several minor streams. The three major rivers are each fed directly or indirectly from the Uinta Mountain range in northeastern Utah. The Bear River starts on the north slope of the Uintas and flows north past Bear Lake, into which some of Bear River's waters have been diverted via a man-made canal into the lake, but later empty back into the river by means of the Bear Lake Outlet. The river then turns south in southern Idaho and eventually flows into the northeast arm of the Great Salt Lake. The Weber River also starts on the north slope of the Uinta Mountains and flows into the east edge of the lake. The Jordan River does not receive its water directly from the Uintas. Rather, it flows from freshwater Utah Lake, which itself is fed primarily by the Provo River; the Provo River does originate in the Uintas, a few miles from the Weber and Bear. The Jordan flows from the north part of Utah Lake into the southeast corner of Great Salt Lake. A railroad line runs across the lake, crossing the southern end of Promontory Peninsula. The mostly solid causeway supporting the railway divides the lake into three portions: the northeast arm, northwest arm, and southern. This causeway prevents the normal mixing of the waters of the lake due to the fact that there are only three 100-foot breaches. Since there are no rivers, with the exception of a few minor streams, flowing directly into the northwest arm, Gunnison Bay, it is now substantially saltier than the rest of the lake. 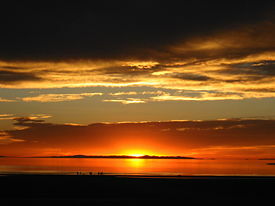 Sunset viewed from the western shore of Antelope Island. The size and whether or not they are counted as islands during any particular year depends mostly on the level of the lake. From largest to smallest, they are Antelope, Stansbury, Fremont, Carrington, Dolphin, Cub, Badger, Strongs Knob, Gunnison, Goose, Browns, Hat (Bird), Egg Island, Black Rock and White Rock. Dolphin, Gunnison, Cub, and Strongs Knob are in the northwest arm, and the rest are in the southern portion. There are also a number of small, unnamed islands. Black Rock, Antelope Island, White Rock, Egg Island, Fremont Island, and the Promontory mountain range are each extensions of the Oquirrh mountain tange, which dips beneath the lake at its southeastern shore. Stansbury, Carrington, and Hat Islands are extensions of the Stansbury mountain range, and Strongs Knob is an extension of the Lakeside Mountains that run along the lake's western shore. The lake is deepest in the area between these island chains, measured by Howard Stansbury in 1850 at about 35 feet (10.7 m) deep, and an average depth of 13 feet (4 m). When the water levels are low, Antelope Island becomes connected to the shore as a peninsula, as do Goose, Browns and some of the other islands. Stansbury Island and Strongs Knob remain peninsulas unless the water level rises above average. At high levels, some of the smaller islands become completely submerged. Due to the warm waters of the Great Salt Lake, lake-effect snow is a frequent phenomenon of the lake. Cold north, northwest, or west winds generally blow across the lake following the passage of a cold front, and the temperature difference between the warm lake and the cool air can form clouds that lead to precipitation downwind of the lake. It is typically heaviest from eastern Tooele County east and north into central Davis County. It can deposit highly localized but excessive snowfall amounts, generally with a narrow band of snow highly dependent on the direction the wind is blowing. Great Salt Lake differs in elevation between the south and north parts. The Union Pacific Railroad causeway divides the lake into two parts. The water-surface elevation of the south part of the lake is usually 0.5 to 2 feet higher than that of the north part because most of the inflow to the lake is to the south part. The project was designed to increase the surface area of the Great Salt Lake, and therefore the rate of evaporation. The pumps released Great Salt Lake's waters into the 320,000-acre (1300 km²) Newfoundland Evaporation Basin in the west desert. A weir in the dike at the south end of the Newfoundland Mountains regulated the level of water in the basin and returned salty water from the basin to the main body of Great Salt Lake. At the end of their first year in operation, the pumps had released around 500,000 acre feet (0.6 km³) of water. The project was shut down in June 1989, as the lake had dropped almost 6 feet (2 m) since reaching its peak in June 1986 and March 1987. The Utah Division of Water Resources credits the project with "over one-third of that decline." In total, the pumps released 2.73 million acre feet (3.4 km³) of water while they operated. Although the pumps are not currently in use, they are maintained in the event the lake rises to those levels again. Most of the salts dissolved in the lake and deposited in the desert flats around it reflect the concentration of solutes by evaporation; Lake Bonneville itself was fresh enough to support populations of fish. More salt is added yearly via rivers and streams, though the amount is much less than the relict salt from Bonneville. 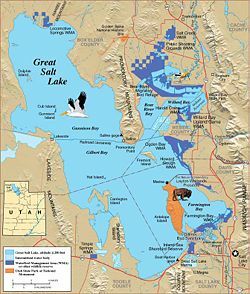 The salinity of Great Salt Lake is highly variable and depends on the lake's level; it ranges from 5 to 27 percent, or (or 50-270 ppt). For comparison, the average salinity of the world ocean is 3.5 percent (35 ppt). The ionic composition is similar to seawater, much more so than the Dead Sea's water; compared to the ocean, Great Salt Lake's waters are slightly enriched in potassium and depleted in calcium. The high salinity of the lake makes it uninhabitable for all but a few species, including brine shrimp, brine flies, and several forms of algae. The brine flies have an estimated population of over one hundred billion, and serve as the main source of food for many of the birds that migrate to the lake. However, the fresh- and salt-water wetlands along the eastern and northern edges of the Great Salt Lake provide critical habitat for millions of migratory shorebirds and waterfowl in western North America. These marshes account for approximately 75 percent of the wetlands in Utah. 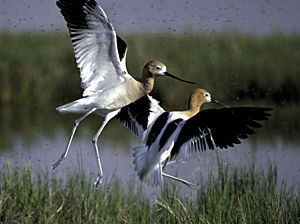 Some of the birds that depend on these marshes include: Wilson's phalarope, red-necked phalarope, American avocet, black-necked stilt, marbled godwit, snowy plover, western sandpiper, long-billed dowitcher, tundra swan, American white pelican, white-faced ibis, California gull, eared grebe, peregrine falcon, bald eagle, plus large populations of various ducks and geese. There are 27 private duck clubs, seven state waterfowl management areas, and a large federal bird refuge on Great Salt Lake's shores. Wetland/wildlife management areas include the Bear River Migratory Bird Refuge; Gillmor Sanctuary; Great Salt Lake Shorelands Preserve; Salt Creek, Public Shooting Grounds, Harold Crane, Locomotive Springs, Ogden Bay, Timpie Springs and Farmington Bay Waterfowl Management Areas. Several small islands in the lake provide critical nesting areas for various birds. Access to Hat, Gunnison and Cub islands is strictly limited by the state of Utah in an effort to protect nesting colonies of American white pelican (Pelecanus erythrorhynchos). There are no fish in the Great Salt Lake because of the high salinity. The only aquatic animals able to live in the lake are tiny brine shrimp (Artemia franciscana). Their tiny, hard-walled eggs or cysts (diameter of about 200 micrometers)  are harvested in quantity during the fall and early winter. They are fed to prawns in Asia, sold as novelty "Sea-Monkeys," sold either live or dehydrated in pet stores as a fish food, and used in testing of toxins, drugs, and other chemicals. There are also two species of salt flies and some bacteria and algae. Salinity differences between the sections of the lake separated by the railroad causeway result in significantly different biota. A phytoplankton community dominated by blue-green or green algae tints the water south of the causeway a greenish color. North of the causeway, the lake is dominated by Dunaliella salina, a species of algae that releases beta-carotene, and the bacteria-like haloarchaea which together give the water an unusual reddish or purplish color. These color differences are especially noticeable in satellite photographs. Although brine shrimp can be found in the arm of the lake north of the causeway, studies conducted by the Utah Division of Wildlife Resources indicate that these are likely transient. Populations of brine shrimp are mostly restricted to the lake's south arm. A solitary Chilean flamingo named Pink Floyd once wintered at the Great Salt Lake. He escaped from Salt Lake City's Tracy Aviary in 1987 and lives in the wild, eating brine shrimp and socializing with gulls and swans. (Pink Floyd is often referred to as a "he," although the bird's gender is not actually known.) A group of Utah residents suggested petitioning the state to release more flamingos in an effort to keep Floyd company and as a possible tourist attraction. Wildlife biologists resisted these efforts, saying that deliberate introduction of a non-native species would be ecologically unsound and might have detrimental consequences. Pink Floyd was last seen in Idaho (where he was known to migrate) in 2005. He has not been seen since that time and is presumed to not have survived the winter of 2005-2006. After later studies were conducted with a larger number of birds, the advisories were revised and another was added for cinnamon teal. Seven other species of duck were studied and found to have levels of mercury below EPA guidelines, thus being determined safe to eat. Solar evaporation ponds at Great Salt Lake's northeast end. Solar evaporation ponds at the edges of the lake produce salts and brine (water with high salt quantity). Minerals extracted from the lake include: sodium chloride (common salt), used in water softeners, salt lick blocks for livestock, and to melt ice on local roadways; potassium sulfate (potash), used as a commercial fertilizer; magnesium-chloride brine, used in the production of magnesium metal, chlorine gas, and as a dust suppressant. Food-grade salt is not produced from the lake, as it would require further costly processing to ensure its purity. Mineral-extraction companies operating on the lake pay royalties on their products to the State of Utah, which owns the lake. The harvest of brine shrimp cysts during fall and early winter has developed into a significant local industry, with cysts selling for as high as $35 a pound. Brine shrimp were first harvested during the 1950s and sold as commercial fish food. In the 1970s the focus changed to their eggs, known as cysts, which were sold primarily outside the United States to be used as food for shrimp, prawns, and some fish. Today, these are mostly sold in Asia and South America. The amount of cysts and the quality are affected by several factors, but salinity is most important. The cysts will hatch at 2 to 3 percent salinity, but the greatest productivity is at salinities above about 10 percent. If the salinity drops near 5 to 6 percent, the cysts will lose buoyancy and sink, making them more difficult to harvest. A large resort called Saltair has been operated on the southern shore of the lake off and on for many years. Rising and lowering water levels have affected Saltair, and it has burned down twice. Currently it serves as a concert venue. The new resort built in 1981 after large fires completely destroyed the second and largest in the 1960s, is but a skeleton of the resort's former grandeur. Dramatically fluctuating lake levels have inhibited the creation and success of tourist-related developments. There is a problem with pollution of the lake by industrial and urban effluent. Also, especially when the waters are low, decay of insects and other wildlife give the shore of the lake a distinctive odor, which may keep some tourists from coming near the lake. Despite these issues, the lake remains one of Utah's largest tourist attractions. Antelope Island State Park is a popular tourist destination that offers panoramic views of the lake, hiking and biking trails, wildlife viewing, and access to beaches. ↑ Utah Geological Survey. 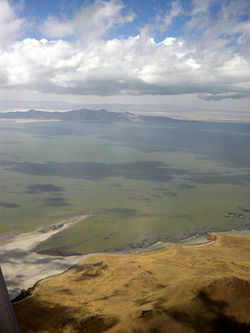 Commonly Asked Questions About Utah's Great Salt Lake and Ancient Lake Bonneville, 5 www.utah.gov. Retrieved December 20, 2007. ↑ Joe Bauman. August 05, 1999. - Lake has great impact on storms, weather. Deseret Morning News. Retrieved December 20, 2007. ↑ Utah Division of Water Resources. Fact Sheet: West Desert Pumping Project. Retrieved December 20, 2007. ↑ Utah Wetlands Interpretive Network. Utah Wetlands Interpretive Network. Retrieved December 20, 2007. ↑ U.S. Geological Survey. Brine Shrimp and Ecology of Great Salt Lake. Retrieved December 20, 2007. ↑ Utah Division of Wildlife Resources. High mercury levels found in two duck species. www.wildlife.utah.gov. Retrieved December 20, 2007. ↑ Utah.com Great Salt Lake. Retrieved December 20, 2007. ↑ William F. Case, Pink Water, White Salt Crystals, Black Boulders, and the Return of Spiral Jetty!. Utah Geological Survey. Retrieved December 20, 2007. ↑ Utah Geological Survey. Great Salt Lake. Retrieved December 20, 2007. CNN Travel. November 5, 2003. Great Salt Lake: More than meets the nose. Retrieved December 20, 2007. Deseret News. Great Salt Lake - A Special Report Retrieved December 20, 2007. Hull, Rebecca L. December 13, 2002. Overview of the Great Salt Lake Utah Museum of Fine Arts. Retrieved December 20, 2007. University of Utah Department of Meteorology. Monitoring the Weather over the Great Salt Lake. Retrieved December 20, 2007. Utah Division of Water Resources. West Desert Pumping Project. Retrieved December 20, 2007. Utah Geological Survey. Commonly Asked Questions About Utah's Great Salt Lake and Ancient Lake Bonneville. Retrieved December 20, 2007. Utah State Government. Utah Division of Wildlife Resources Retrieved December 20, 2007. History of "Great Salt Lake"
This page was last modified on 14 July 2017, at 22:11.